When we talk about the compact mineral from PORCELANOSA Group, and add the adjective “new generation”, our intention is not to semantically differentiate ourselves from the rest of the Solid Surface market. Instead, our intention is to explain in just two words that KRION®, thanks to our constant research and work to provide our clients with the best possible material, indulges us to the maximum and is at the cutting edge of raw materials and the final result of our production. To show our efforts in achieving excellence, we have a multitude of certifications in all possible fields. 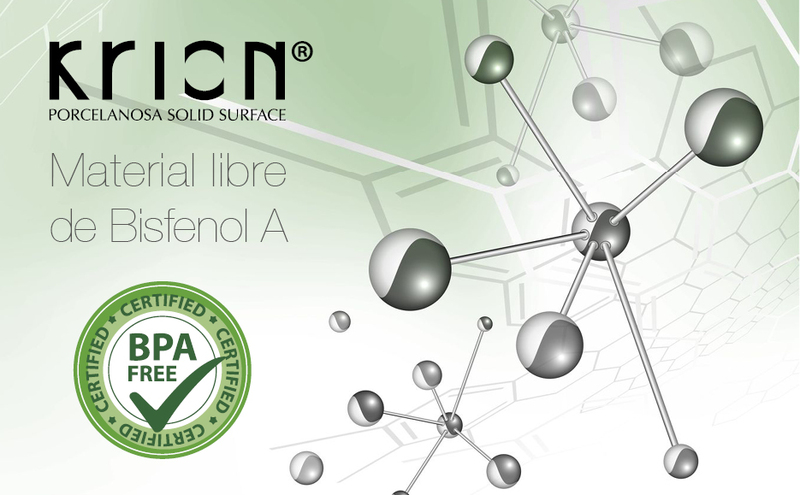 Today we wish to show you one of the latest studies which we are especially proud of, as we are of all those related to health, which shows that KRION® IS A MATERIAL WHICH IS FREE OF BISFENOL A or BPA. Bisphenol A is an organic compound, mainly used to make plastics. It is used to produce a wide variety of every day products, including water bottles, sports equipment, medical and dental devices, CDs and DVDs, and various household appliances. Why is Bisphenol A harmful to health? For some years, and after numerous studies, BPA has been suspected of being harmful to humans. Its toxic effects are due to the consumption of materials which contain this substance, such as packaging, cans, or a wide range of containers. The continuous presence of this compound in the organism has been related to a greater risk of suffering from various serious illnesses. Bisphenol is capable of causing imbalances in the hormonal system at very low concentrations, with possible repercussions on health.